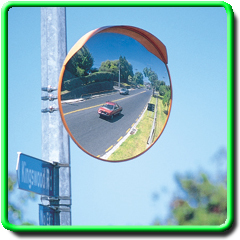 The Premium acrylic mirror face is designed with a shallow radius of curvature, making this range of safety mirrors ideal for traffic situations. The hood and back are made from galvanized steel and powdercoated for long life. Fitted with a thick vinyl extrusion also in a high visiability finish to protect the mirror edge and to add to the mirror's visual apperance. The 600mm size comes complete with J-Bracket and U-Bolts for mounting to a 75mm pole. 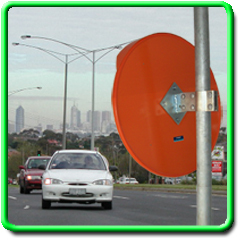 The 800mm and 1000mm sizes come complete with clamp bracket for mounting to 75mm poles. If needing to mount the 800mm and 1000mm mirrors to a wall or post, you can purchase a Wall Mounting Bracket to enable this (see Wall Mounting Accessories).